If you’re looking for a vintage Rolex Day-Date President to add to your collection, then there are some differences between models to consider. More specifically, there are single and double quickset models to choose from. As the name suggests, the dial of a Rolex Day-Date indicates both the day of the week (at 12 o’clock) and the date (at 3 o’clock). Therefore, a single quickset allows the setting of the date of the month independently from the hour hands, but not the day of the week. As a result, changing the day displayed at 12 o’clock requires moving the time forward past midnight. On the other hand, on a double quickset model, the adjustments of both the day and date are independent of the time. You can see how far the Rolex Day-Date has come by looking at the President ref. 228235. Here we delve into four different vintage Rolex President references including both single and double quickset models. 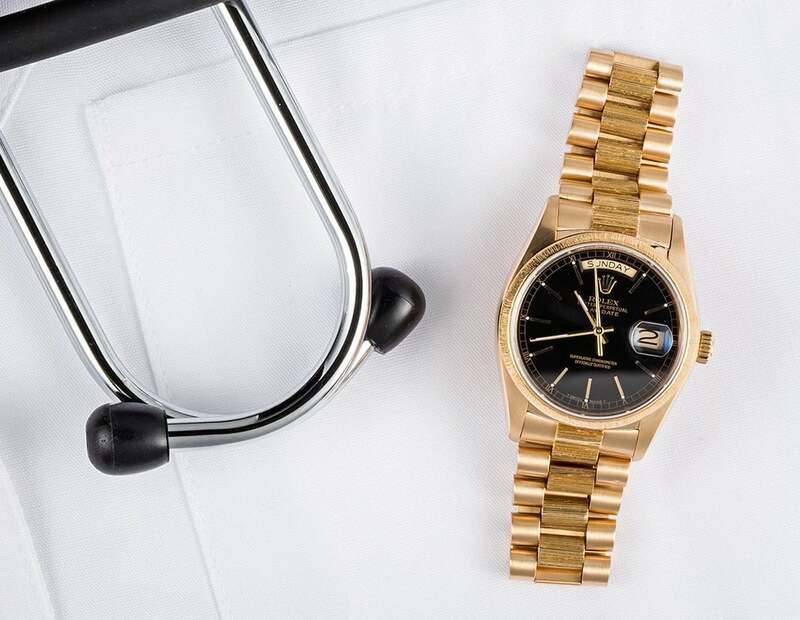 Launched in 1977, the Rolex President ref. 18038 introduced some improvements to the Day-Date line. In addition to now being furnished with a sapphire crystal, the Day-Date ref. 18038 also included the quickset date feature. Powering the Rolex ref. 18038 was the new Caliber 3055. Constructed in 18k yellow gold, featuring a 36mm Oyster case, sporting a fluted bezel, and, of course, equipped with the President bracelet, the ref. 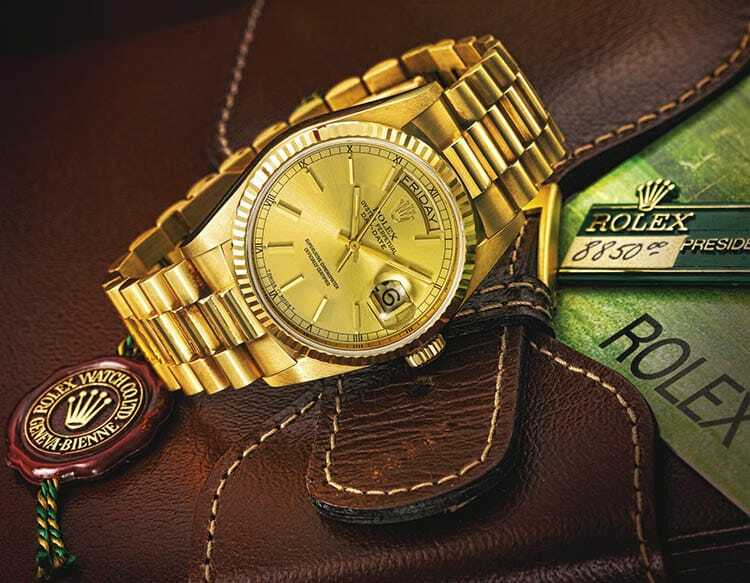 18038 is a classic vintage Rolex Day-Date reference for both men and women. The Day-Date was launched in 1956. Similar to the above Rolex President ref. 18038, the production of the ref. 18078 ran from the late 1970s until the late 1980s. Internally, the Day-Date ref. 18038 and the ref. 18078 are identical, both driven by the Rolex Caliber 3055. However, the Rolex President ref. 18078 is distinguished by its bark accents. The center links of the President bracelet feature bark-like textured gold, which gives the model its distinct look. Sometimes, that design is also found on the bezel. The President Bark is ideal for someone who appreciates the overall iconic style of a vintage Rolex Day-Date but likes a little something extra. A Rolex President 18078 is not ordinary, be sure to examine the bark accents. In 1988, Rolex introduced the President ref. 18238. 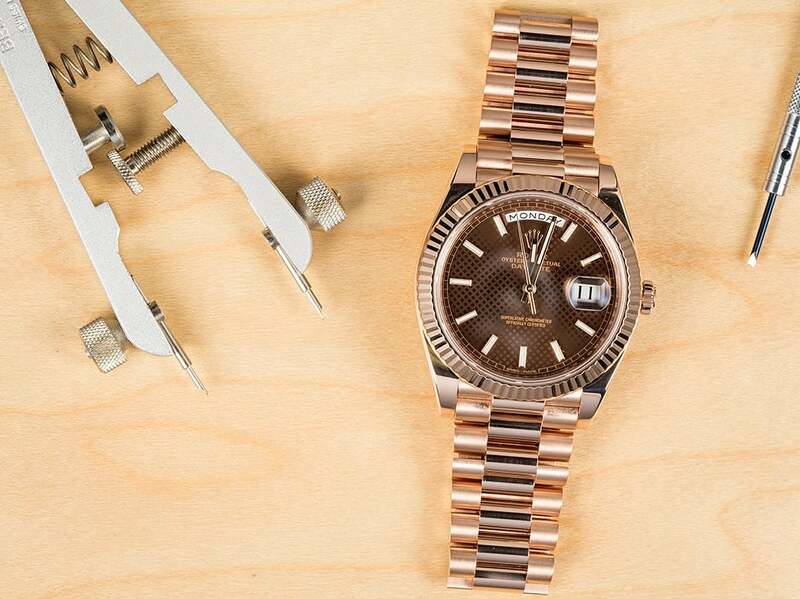 Within the new model was the Rolex Caliber 3155, which now included the double quickset function. The ability to change both the day and date independently from the time offers much more practicality for wearers. In fact, the Caliber 3155 is still available in today’s Rolex Day-Date 36 models. The vintage Rolex Day-Date ref. 18238 dons the traditional design of an older Rolex President but also boasts modern practicality. Rolex has evolved the Day-Date ref. 118238 and engineered it to have the day and date move independantly. Since Rolex updated their classic Day-Date line with a new caliber, they followed suit with the President Bark models. The Day-Date ref. 18248 still had the interesting bark-like embellishments on the bracelet and bezel, but it now also had the Caliber 3155 beating within. 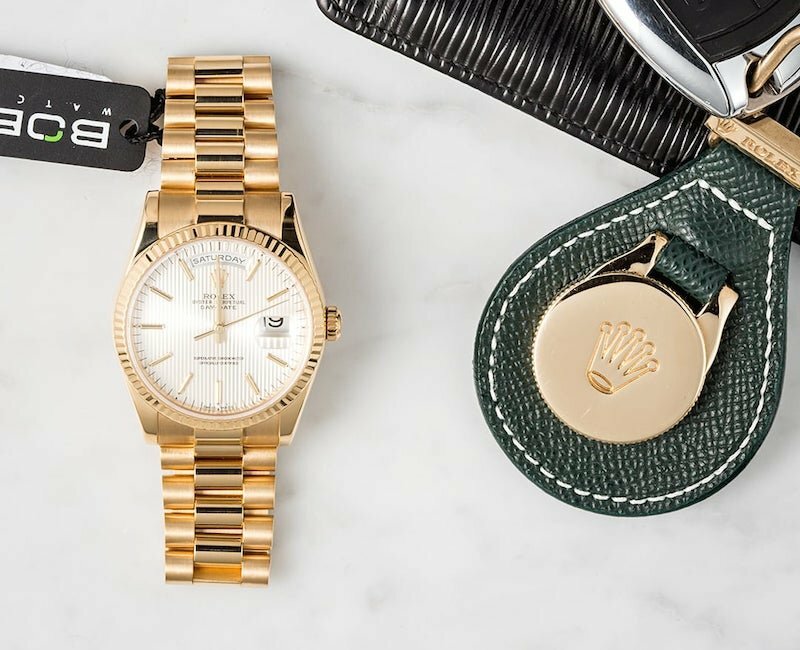 Retro vibes coupled with contemporary functionality is what the vintage Rolex Day-Date ref. 18248 offers. Any of the above vintage Rolex President models are a great choice. The undisputed king of luxury dress watches, there’s no denying the enduring appeal of the Rolex Day-Date.